The Pennsylvania Consortium for the Liberal Arts aims to promote collaborative initiatives to improve academic programs, create cost efficiencies, and contribute to the national discussion on higher education. 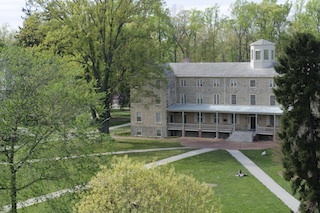 Haverford is part of a group of ten liberal arts colleges in Pennsylvania that has received an $800,000 grant from The Andrew W. Mellon Foundation to create the Pennsylvania Consortium for the Liberal Arts (PCLA), an entity designed to help each institution create new cost efficiencies, improve the quality of academic and co-curricular programs, and enhance inter-institutional knowledge and collaboration. The consortium also plans to contribute in important ways to national discussions about improving access to higher education and improving affordability for families. In addition to Haverford, the consortium of 10 Pennsylvania colleges includes Bryn Mawr College, in Bryn Mawr, Pa.; Dickinson College, in Carlisle, Pa.; Franklin & Marshall College, in Lancaster, Pa.; Gettysburg College, in Gettysburg, Pa.; Juniata College, in Huntingdon, Pa.; Muhlenberg College, in Allentown, Pa.; Swarthmore College, in Swarthmore, Pa.; Ursinus College, in Collegeville, Pa.; and Washington & Jefferson College, in Washington, Pa. The grant, which will be expended over three years, will provide seed money for collaborative programs among the various participants. The member colleges, each with its individual assets, will contribute and benefit in ways distinct to their institutional strengths and needs. In pursuing the Mellon grant, the leaders of the institutions asserted that their first priority as a consortium "is to enhance the strong liberal arts preparation we provide our students while controlling associated costs." The 10 consortium members will explore and develop collaborative programs in seven core areas: academic program improvement; faculty development; study abroad; library resources; administrative services; compliance and risk management; and enhancing the institutional climate for diversity. --Using teleconferencing and online technology to combine under-enrolled courses at member institutions. For example, in the coming academic year Juniata, Gettysburg and Washington & Jefferson will each do the planning to allow them to offer a language course that will be shared across their campuses. --Training for faculty chairs of academic departments; for example, bringing faculty together with college leaders to better understand and examine financial models, workshops on teaching in a diverse classroom, using technology to enhance learning, and the evolving role of the humanities. --Shared study abroad sites and programs to reduce costs and expand opportunities for students. --Shared library resources, including the expertise of subject specialists and consulting services for such issues as disaster planning and digitization. -- Cooperatives in areas such as health plans, branding and licensing, sustainability management, security in information technology, and purchasing. --Shared expertise and staffing for compliance and risk management. --Shared training for faculty and administrators on issues of race, gender, class and sexual orientation, as well as joint efforts to build pipelines for diverse faculty recruiting.